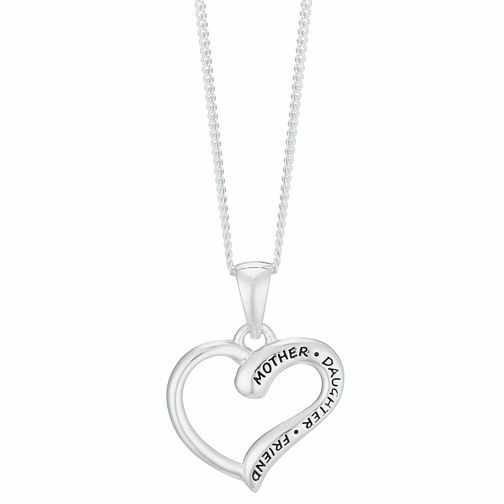 Celebrate your special bond with this mother and daughter heart pendant. Styled in stunning sterling silver, this cute cut-out heart pendant is engraved with the words 'Mother. Daughter. Friend', to represent the unique relationship that is only formed between mother and daughter. Sterling Silver Mother & Daughter Heart Pendant is rated 4.5 out of 5 by 2. Rated 5 out of 5 by Anonymous from Beautiful necklace Bought this for my daughter who was my bridesmaid. Lovely necklace and high quality. Rated 4 out of 5 by Anonymous from Beautiful Beautiful necklace and made a lovely Mother’s Day present. My mum loved it. The only downside is that the pendant is small so the writing is hard to read (I can read it but any slight eyesight problem would mean you couldn’t). Still, it’s lovely and mum loves it so it was great.